Ishwaro Gururatmeti Murti bheda Vibhagine, Vyomavad vyapta dehaya Dakshinamurataye namah. There is no difference between Guru, Self, and Divine. These three are One – your Soul, the Guru Tattva and God. And all these three are not the (physical) body. What is their body like? It is like the sky. ‘Vyomavad vyapta dehaya’ (Vyom = Space, Deha = Body, vyapta = to permeate). You are not the body, you are the Soul, and the form of the Soul is like that of Space. The same is true for the Guru as well. Don’t think of the Guru as the limited physical body. The Guru is the field, the energy which is all permeating; so is the Self. And honoring the Guru is honoring your own Self. There is a beautiful story from the Puranas; in the Indian Mythology. Lord Shiva is the Guru of the entire creation. He is the Guru of all the Devas (Gods). He is called Adiguru – the Guru present from the beginning of time, and He is beyond time. So when Lord Shiva had a son – Karthikeya, he was sent to school to study and receive education from Lord Brahma. Narayanam Padmabhavam – Lord Brahma is Padmabhavam (One who is seated on a Lotus). Lord Brahma is also a Guru, and his Guru is Lord Narayana (Lord Vishnu), and Lord Shiva is the Guru of Lord Narayana. So just like a mother and father send their child to school or a Gurukul, Lord Shiva too sent his son to Lord Brahma to study and receive knowledge. Now Lord Brahma knew all about the alphabets, but he did not know the meaning of Om (the primordial sound). This is because his knowledge was limited to the ‘A’ part of Om. The ‘U’ sound belonged to Lord Vishnu, and ‘M’ belonged to Lord Shiva. So, Lord Brahma did not know completely about Om. So Karthikeya said to Lord Brahma, ‘You do not know the meaning of Om, how will you teach me? I will not study under you.’ And Karthikeya went back to his father, Lord Shiva. Hearing this, Lord Shiva asked Karthikeya, ‘What happened, son? Lord Brahma is the Creator of the entire universe. You must learn from him’. Karthikeya then said, ‘Then I will tell you because I know the meaning of Om’. ‘Then tell me the meaning since you know it’, Lord Shiva said. ‘I can’t tell you like this. You have to give me the place of the Guru. Only if you put me on the pedestal of the Guru can I tell you’, said Karthikeya. So Lord Shiva lifted him on his shoulders and kept him high. And in the ear of Lord Shiva, Karthikeya gave him the meaning of the ultimate truth – What is Om?! The meaning of Om! The symbolism here is that the Guru Principle (Tattva) is like a child. There is sweetness and innocence in the Guru Principle (Tattva). 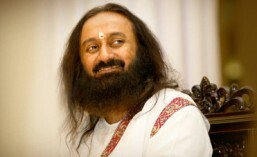 That Guru Principle (Tattva) had to be uplifted by Lord Shiva. Even Lord Shiva had to give that position to the Guru principle; above Himself, because Karthikeya has said that only in this scenario will he teach the knowledge. It is like the water is in the well but to take a shower you have to pump it into the tank and only then you can take a shower. Like that a place had to be given. Honoring the Guru Principle is so essential in life. When you honor it, it is honoring the Self. So here, it is saying that the Guru Tattva is like a child – innocent, intelligent, dignified, yet humble – all the qualities present in an infant, are the signs of the Guru Principle (Tattva). And honoring the Guru Tattva is honoring oneself, it is honoring life itself. And that is Guru Purnima – celebrating and honoring the Guru Tattva. Honoring the Guru is honoring the wisdom, the knowledge, innocence and love. So then what did Karthikeya, the son of Lord Shiva tell Him? He said, ‘Om means Love. You are Love, I am Love. Everything that is present here is Love and is full of it. Love is the essence and the nectar of it all. All that exists is Love.’ This is what Karthikeya said. So the meaning of Om came from that seat. So what did we take back today? Love is the essence of life and it is so delicate. Love and Faith should be handled with care. And Guru’s body is made up of Love and Faith. That is the essence. Guru Purnima is that celebration where you recognize the importance of Love and Faith, and know how to handle with care. Does it make sense? So, this story is very nice. The Guru principle is like a child. I have said it before also; we have thousands of teachers around the globe. I would want them all to remember – Make your life pure, sincere, and you will have no dearth of anything. I have set an example. In all these years, by thought, word or deed I have not done any harm to anybody. I have not said one bad word in all these years. I can’t take credit for it, I am like that. But I want you also to handle your life with such delicateness and care. I am just telling you it is possible, it is not impossible. And it is possible to live a pure life and still be successful in the world. Only then real success comes; when we tread the path of wisdom. So, to all the thousands of teachers remember humility; be humble. Humility and Dignity! Be royal and dignified. Humility doesn’t mean being weak. That anybody can be, so humble and wiggly wiggly. And you don’t have to be stiff to be royal and dignified – Dignity with humility. Strong with subtlety – usually something that is very subtle is not very strong. But delicate is different, isn’t it? Guru means handle with care (laughter). Like how you mark all delicate stuff as ‘Handle with Care.’ Not fragile but handle with care.